Is your kid the kid who won’t eat at the picnic because he doesn’t like hot dogs? Who refuses the pizza at the pizza party? Who has a diet that resembles a supermodel? Welcome to the club! I have a kid like that too. JC didn’t start off as a picky eater. In the highchair he dined on such exotic fare as pizza, hummus, and macaroni and cheese. Once he hit preschool age though, he started to reject everything. “That’s weird! He really liked (fill in the blank) yesterday! ?” was a commonly heard phrase in our kitchen. The only thing he continued to enjoy was his “jar”: a Stage Four baby food jar with carrots, turkey, and peas, as well as other unidentified mush. It was healthy and easy so we let him continue to eat it– until it became embarrassing. We couldn’t send him to day care with a baby food jar packed in his lunch pack when the other kids were eating normal stuff like sandwiches and cookies. I don’t remember much from those early years, but I clearly remember an incident at Shoprite when I was stocking up on “jar” and the cashier asked me how old my baby was. Umm, four? I thought but didn’t say. Instead I lied and said, “Eighteen months,” the age labeled on the jar. “Lots,” I answered. Lots of mushed up carrots scooped from a jar. With that, the time had come to pull the plug. We decided to cut JC off from “jar” cold turkey (also an ingredient of “jar”) and figured he’d eat when he was hungry. Fast forward through a few pleading and begging sessions and unsuccessful bribery attempts and eventually, JC’s diet whittled down to two ingredients: bread and cheese. With the urging of my Italian born-and-raised husband who immensely enjoys the culinary arts, JC succumbed to the pressure and learned to love strawberries and kiwis. With the welcome addition of fruit to his diet, the “Feast” was born. The Feast. With a Flintstone Vitamin. 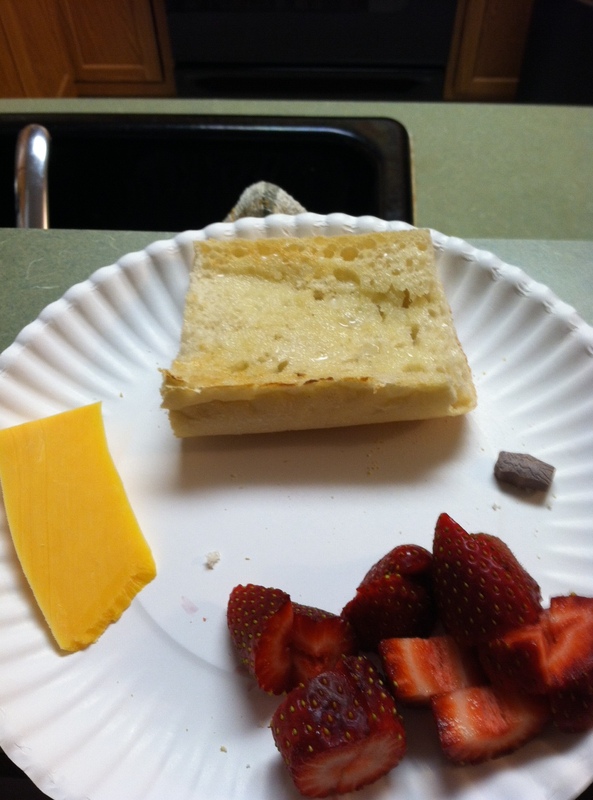 Now that he’s nine and too smart for his own good, he has categorized “feasts” into “traditional feasts” (shown above: bread, cheddar, and strawberries) and “modified feasts,” which include some variation depending on what we have in the cabinets (for example, substituting kiwi for strawberries and/or crackers for bread). It’s his go-to meal. Nowadays, he also dabbles in pizza (with no visible spices, especially green-colored spices), chicken nuggets (McDonald’s only), “green dip” (guacamole) and chips, and Perdue chicken patties (blue bag only). By the grace of God he has taken to eating my mother-in-law’s homemade red sauce so we’ve added pasta to the repertoire (she stacks our freezer full of sauce). Tack on some Oreos and pretzels and in all seriousness, that pretty much sums it up. Amen, kid! (His quotes inspired this post). I found this wrapped up in a piece of paper under the couch. 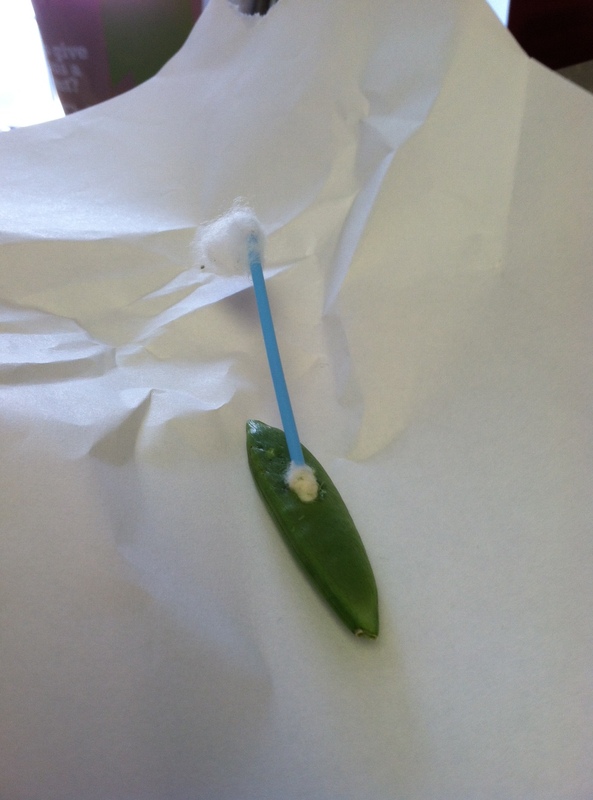 It’s a snow pea with a q-tip shoved into it. Looks like a boat, no? I know you’re thinking it’s time for me to get to the point. My point for all you Parents of Picky Eaters is: don’t worry. JC is healthy according to his bloodwork (despite being a little low on Vitamin D), and he’s growing, and he’s smart (he made a snow pea boat, people). He must be getting what he needs from his constant stream of feasts, since he keeps landing on the right spot on that line graph at the pediatrician’s well visits. If your picky eater is happy and healthy, then why fight the battle? Would it be nice for him to eat a hamburger or hot dog, or possibly even a vegetable? Yes. It would be great. My husband and mother-in-law would be thrilled. But it’s not the end of the world that he doesn’t. Something tells me that once he hits puberty, he’ll expand his palate. For now, as long as his body is getting what it needs I’m happy making feasts. Traditional, modified, or whatever other grub-inspired version he thinks up. Good luck with your picky eaters! Thanks for reading. I have a nephew like that. He always says he is full after eating a few bites, but when cake and ice cream come out, all the sudden he has an appetite. He is almost 7. There’s always room for cake and ice cream 🙂 ALWAYS. Last time, we told him that since he was full, no cake or ice cream, you should have seen his face. That is great! May I use that quote? Hey, he’s expanding his palate to the body of Christ. I think progress has been made. Of course you can use the quote. I love it too. Definite progress with the body of Christ 🙂 As long as he doesn’t ask me to add it to the Feast. Substitute it with oyster crackers perhaps? Or start a new fad: Jesus Pieces. Ha! Stop! You’re gonna get me in trouble! I will be forced to go to confession. Sorry. I get carried away. Say a few “Hail Marys” for me please. I was that kid! (And I’m still really fond of cheese and bread.) Then I became a vegetarian and went from no way anything green to everything green! So you never know. Ahh you give me hope! Thanks! Thanks! It’s probably better yours isn’t into sweets. Mine have never had soda- ever. I am glad because I see a lot of kids guzzling down cokes and think of their poor teeth and sugar levels! I have food issues like texture. And I’ve worked really hard not to pass them on to Mr. T and I must have done a good job as he eats tomatoes and I won’t go near them! My friends kid loves fruit and veggies, and hates meats. She has to get her protein from cheese and pasta, but my friend has finally (most days) become okay with it since her daughter is healthy. So, I’m with you, he’s healthy, that’s what matters! That’s awesome that you didn’t pass on your food issues to T. It’s frustrating when we are out and he just eats the bread off the table, but I agree that as long as there is not harm, let him be. T eating you out of house and home yet? I hear that happens. Ha, we hide the good stuff in our kid’s meals. For example, one of my kids doesn’t like broccoli, so we’ll make cream of broccoli soup and call it tree soup instead. That stuff disappears like magic! Another strategy is layering vegetables in with the good stuff like mixed hamburger patties. They have no clue. I’m very lucky – no picky eater at my house. He never really was, and now he’s at the “eating out of house and home” stage. Of course, we have food intolerances, so there is a lot that we *can’t* eat. Although when I’m all by myself, I would consider JC’s Feast to be pretty darned spectacular (either the feast or peanut butter off a spoon)! My almost 4 year old: Meat and potatoes. He even slams his sippy cup down like it’s a stein of beer. He hates veggies of all kinds. Yet, when he was a baby he ate EVERYTHING. We all feel your pain! Thanks! I am glad to hear I am not the only one. Maybe it’s a boy thing? Highly sensitive, that is a key word. Often, it comes packaged with gifts.